The communities join together on a risky run into Washington, D.C. to look for farming supplies. 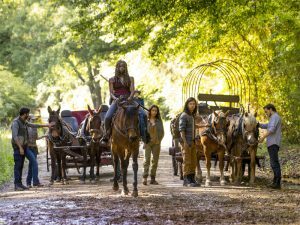 After a fatality tensions run high at Hilltop, while Daryl decides he wants to leave the Sanctuary. Last edited by GateWorld; October 12th, 2018 at 12:26 AM. This is the first episode that I've really, unreservedly enjoyed in a quite a while. Such a shame that that optimism about the show finally getting back on track is overshadowed by the impending departures of Lauren Cohan and Andy Lincoln. I have no idea how this show can possibly work without them. I am looking forward to the Whisperers, perhaps they end up having to release Negan after Rick is gone to help with the new threat?? Interesting start to the season but I agree with Digi. Ive been wavering for a while and that big a change could be the end for me. This is a big season for me to continue watching it. Finally sat down and watched this through. I liked that the opening titles, which have kept some aspect of each season thus far - were completely refreshed. (Err - well, yes, right?) A new beginning indeed, and yet of course, still totally The Walking Dead. I agree - was worried that Gregory's cancer would continue to spread, so I was very glad to see him hang in ep 1! He should have been killed off back during the Savior's siege, but at least he's served a purpose for this new season's apparent theme. Jadis / Anne - suddenly part of the gang?? And basically normal now? Not sure how that sits with me. Did we know Maggie's baby's name in S8? Have to admit, when she said she had to get back to The Hilltop because of Hershel, it really threw me! Nice to see the tribute to Scott Wilson. FWIW, Hershel is the name of her kid in the comics, too -- he first appeared in issue #130, in August 2014. "Apotheosis was the beginning before the beginning"